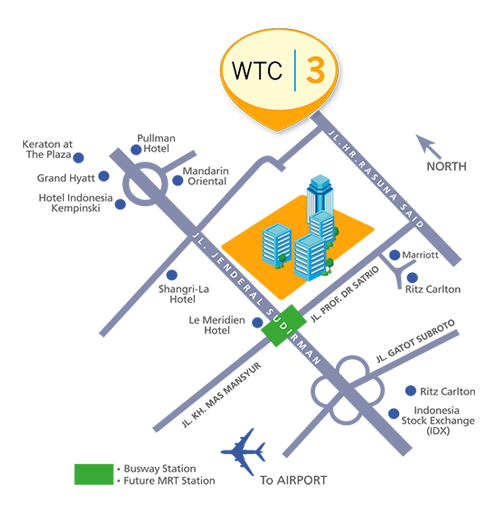 WTC 3 is located within the highly sought after WTC complex, strategically fronting onto Jalan Jenderal Sudirman, the principal thoroughfare of the Golden Triangle and Jakarta’s central business district. Surrounded by road and foot access on three sides, the WTC site benefits from multiple entry points, which greatly facilitate vehicular and pedestrian traffic flow. When operational, the upcoming MRT station will feed into WTC’s main entrance, further enhancing the transport links of the 8 hectare site. As a prime location with Jakarta’s downtown, the immediate vicinity of the site is also home to 5-star hotels and other landmark office towers. WTC 3 is close to the Indonesia Stock Exchange and the Semanggi flyover for easy access to the airport toll road and Jalan Gatot Subroto, the major east-west artery that runs through the city centre. Several large shopping malls are within 10 minutes’ drive of the complex.